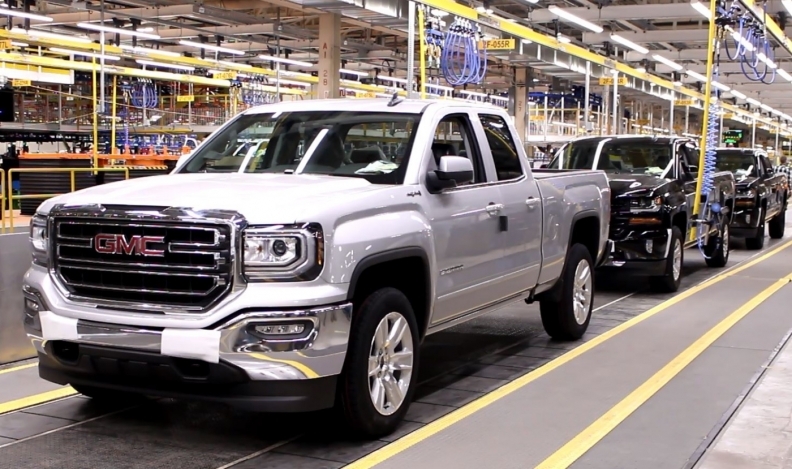 GM ships unfinished Chevrolet Silverado and GMC Sierra truck bodies to Oshawa from a factory in Fort Wayne, Ind. General Motors plans to begin winding down vehicle assembly at its Oshawa, Ont., plant in the summer. David Paterson, vice president of corporate and environmental affairs at GM Canada, said the automaker plans to end one of its two truck assembly shifts in summer 2019, followed by the end of the other truck shift and its car assembly line at year’s end. Oshawa Assembly produces the Chevrolet Impala and Cadillac XTS sedans and does final assembly on pickup bodies for previous-generation Chevrolet Silverado and GMC Sierra trucks. Paterson stressed that no “final decisions” have been made as to which specific dates the shifts will wind down. “It’s important to discuss that with Unifor,” he said. Oshawa was one of three North American assembly plants that GM said it would stop allocating product to in 2019 as part of a broader shift in its global product strategy. GM is ending production of several cars, including the Impala and XTS, and it plans to stop building the previous-generation Silverado and Sierra pickups in 2019. Closing Oshawa Assembly would cost about 2,600 workers their jobs. Paterson said about half of those workers will be retirement-eligible and can receive a full pension from GM. Others might be entitled to a partial pension or other supports laid out in the automaker’s contract with Unifor, he said. “We have the responsibility right now to give our union and our employees notice that there won’t be jobs at the end of 2019. We’re in that process now,” he said. Unifor President Jerry Dias has blasted GM for its decision, calling it “the ultimate betrayal” and promising a major fight with the company unless it agrees to allocate new product to the plant. "We are talking about keeping the plant open, period. Our members in Oshawa want their jobs. They're not looking to be retrained," Dias said on Tuesday following a meeting with Prime Minister Justin Trudeau, according to The Canadian Press. Asked if there was any possibility for new production at the plant beyond 2019, Paterson said GM did not “want to cause false hope” for workers.